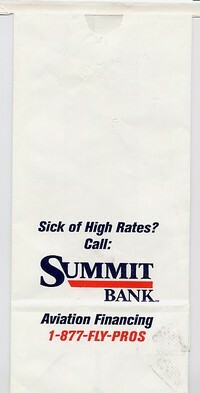 ephemera: I've been trying to find an air sickness bag collector for a long time. It's going to be fun talking with you. When did you become interested in air sickness bags? Silberberg: I used to collect stamps, but found that I did not even have the most extensive collection in my own bedroom...that I shared with my brother. I looked for alternate forms of expression, such as collecting Styrofoam wig heads--too bulky-- and sardine keys--too difficult to obtain and differentiate. So in 1981, on a long, boring United flight from Boston to San Francisco, the proverbial light spilled out from the seatback, like in those space alien movies, and I've never looked back. I still have the sardine keys, by the way. ephemera: Sounds like it was meant to be. What challenges or obstacles do you encounter in collecting? How do you overcome these challenges? Silberberg: There are two big challenges. The first is that other collectors regularly outbid me on eBay . Not surprisingly, many collectors are businessmen...yes, we are overwhelmingly male...who travel extensively, which is how they come upon bag collecting to begin with. Such well heeled travelers often have large amounts of disposable income, so that some bags sell for over $200 USD... usually the auctions are in Euros or Pounds. The other challenge is finding bags that I know exist, but never hit eBay . Strangely enough, most people will just throw out a souvenir bag they collect without stopping to think that it may be valuable to someone. So for instance, there was just a John Waters film marathon in Baltimore a month ago in which they distributed bags to attendees. Despite having contacted the venue and the company that produced the film festival, nobody seems to have any bags left or know how to get them. This is extraordinarily frustrating for me since I know they exist, but have no idea how to obtain one. ephemera: One man's trash is another man's treasure...that's a syndrome we talk about a lot here...What are your favorite items in your collection? Silberberg: I specialize is collecting bags that were never meant to be used for nausea. So while I love the bag from the McDonald's corporate and the Space Shuttle bag, I am much more interested in either of the two George W. Bush bags, the Hillary Clinton bag, the Summit Bank bag, or the Pink Flamingos bag because they are purely a cultural phenomenon that reveals something about society that a functional one may not. 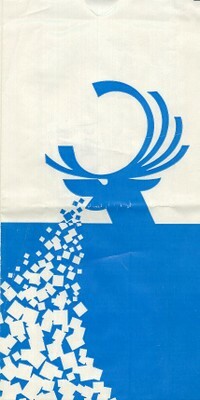 ephemera: They certainly make a strong point from a marketing perspective. What’s your advice for achieving success as a collector? Silberberg: It's the same advice as I have for achieving success in life. Figure out what success means to you first and then achieve it. Why would you let me dictate the terms of your most heartfelt motion sickness aspirations? There are a small but vocal few air sickness bag collectors who try to delineate rules about what constitutes an item that can be added to your bag count because, as we all know, more is better. The gist of these rules are minutiae such as, do you consider a barf bag with a straight edged top to be different than the identical bag with a serrated top or one with a thumb tab? The answer is, who the hell cares? 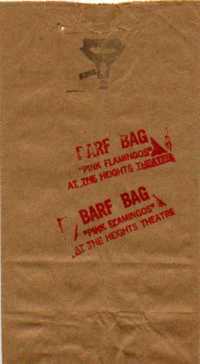 They're bags you puke in! If collecting two almost-identical bags, save for serration is rewarding for you--then you have achieved success...Guinness be damned. ephemera: That's a great philosophy. What resources and tools do you recommend? Silberberg: The bad news is that there really are no books, magazines, catalogs or other reference material for our esoteric avocation. The good news is that we as a community all know each other at least superficially and confab regularly via a Yahoo Group, so that most all experts around the world are almost instantaneously accessible. Storage is a matter of preference. Most of us place our bags in plastic archival sheet protectors and shove them in binders. One collector, Bob Grove of San Diego, displays his in frames all over the walls of his house, but most of us don't have quite-so-understanding a significant other. One other tool I recommend is an ice pick to jab into your own forehead when you realize how much of your life is devoted to collecting air sickness bags. ephemera: The ice pick suggestion works for many categories of collectibles, I'll bet. Thanks for sharing your collection of bags designed to hold chunks of puke. It was truly a pleasure speaking with you. Here's a great and fun site on the subject. Seen it before?